”Plays like a village full of haunted fiddlers”, wrote the leading Finnish newspaper about Emilia Lajunen. Emilia Lajunen (born 1979) is a well known professional Finnish folk musician, known for her personal, strong, and modern style of playing the violin. Her style of playing claims its origins in archaic heritage and fiddler music. Lajunen initially studied folk music under the guidance of Ritva Talvitie and the legendary group Tallari. She furthered her studies at Sibelius Academy (MMus, 2007) and at the Royal Academy of Music in Stockholm. From 2010 to 2015 Lajunen has occupied the position of the Violin Techer-in-charge in the folk music department of Sibelius Academy. Lajunen’s instruments are the violin and the keyed fiddle. She is a member in such groups as Suo, Spontaani Vire, Juuri & Juuri. Her solo album, Turkoosi Polkupyörä, was released in 2012. As a cyclist Emilia Lajunen has ridden from home to Croatia, 400 kilometers in day and to work every day. She has won the extremely legendary, extremely unofficial VPCX cyclocross cup many times, but does occasionally some official races too. Lajunen started cycling in 2008 with a turquoise bicycle. Later she nameda polska tune and her first solo album after this elegant elegant fixie. Nowadays Lajunen has got beautiful steel bicycles for all purposes, and she stores them all in her kitchen. 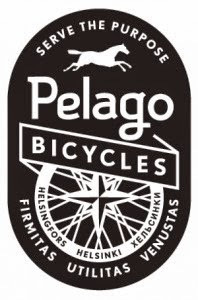 In summer 2015 Emilia Lajunen is sponsored by Pelago Bicycles.